“Thank you Lenore, thank you for a wonderful year of classes,” I said in May 2012. “You have the schedule for September, you can be here right?” Lenore replied. “Of course, what would I do without your classes?” We hugged. “Your dancing is beautiful,” she murmured. “The material you give us to dance is what is beautiful,” I said. We both smiled. In September 2012, 6:30 AM on a Wednesday morning I am dressed and ready to get the train to New York when my phone rings. Lenore’s sister Peggy calls me to say that Lenore passed peacefully into death an hour earlier. I was on my way to see my teacher of 27 years for what I knew would be one last visit. Between June and September Lenore and all who loved her, knew that her time was limited. She was in hospice care for lung cancer that had spread to her bones and liver. During those four months, I savored my visits with her. I also “interviewed” her, to document what I could of her life, mainly for my own understanding. Little did I know I would be receiving a powerful lesson in approaching death with fearless grace. For my first visit Lenore prepared a life history in chronological order, handwritten on a piece of yellow legal paper. She chose not to be filmed so we talked together on her bed. She was propped up on pillows half seated with her long legs extended. I was cross legged with a notebook and a small recorder alongside her on the bed facing her. After she read through her notes, I began to ask questions more or less following the order of her writing. The more we talked, the livelier Lenore became, sitting up, gesturing and gleefully sharing long ago tales with me. Our visits were scheduled for the middle of the day when she had the most energy. Sometimes we would watch a video of her choreography. On one visit she had a manila envelope of photographs for me. We also looked at programs from decades of performances and teaching assignments. One day, when I expressed interest, she gave me her teaching notes from the past year. Each 5.5 x 7 inch notebook page filled with precise explanations of class combinations, each letter of each word perfectly formed like the dance combinations themselves. 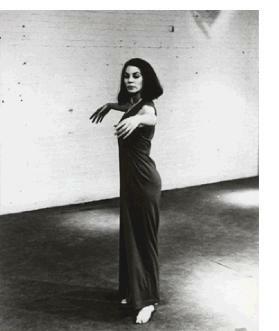 Lenore had a life-long passion for the choreography and movement style known in the modern dance world as the Limón technique. Never one to shy away from strong opinions, she would often say the only choreography she liked was her own and Jose Limón’s. Lenore first saw the José Limón Dance Company perform in Washington D.C. when she was a teenager. Her family lived in the D.C. area while her father, Murray W. Latimer, was advising President Franklin Roosevelt on social service programs, including Social Security. Lenore was excited by the dancing and choreography of the Limón Company, one of the premiere modern dance companies of the 20th century. José Limón and Betty Jones taught a master class which Lenore attended. Lenore had studied modern dance from ages 10 – 12 with Evelyn Delatour and then began again at age 15 with Erica Thamey, who had danced with Mary Wigman in Europe. Lenore’s mother, Edith Sonn Latimer, felt that ballet was old fashioned and saw to it that both Lenore and her younger sister Peggy kept up with the modern arts. In 1952 at age 18, Lenore, with her father’s support, went off to the American Dance Festival at Connecticut College to study with José Limón. Her teachers were a “Who’s who” of the modern dance world. 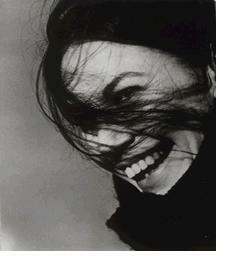 She studied with Martha Graham, Doris Humphrey and Louis Horst. Lenore returned to ADF in 1953 after completing her first year in Madison at the University of Wisconsin. During her second time at ADF, she was chosen to understudy a role in a Doris Humphrey classic, With My Red Fires. Doris Humphrey was a great influence on José Limón; she was a teacher and mentor for thirty years, becoming artistic director of the Limón Company when it was formed. Her movement style was based on the motion of breathing; the rise of inhaling leading to suspensions and movements that lift and the release of exhaling leading to movements that fall and drop. The technique of Humphrey, carried on and developed by José Limón, is one in which the weight of the dancer’s body is ever shifting in relationship to both ground and space. year, the Limón Company came to the University on tour. Classic works The Moor’s Pavane and Traitor were on the program. Once again, the performance inspired Lenore. Lenore knew she wanted more of what they offered and was determined to study with Limón. Lenore moved to New York City in 1955 with the goal of getting into Juilliard, where Limón was teaching. There were trials, one of which occurred in a ballet class taught by Anthony Tudor. During her sophomore year, Tudor stopped class to tell Lenore she had “…feet like pancake spatulas, she had nothing.” That experience nearly flattened her; it was the only time Lenore remembers almost not being able to go on in a class. Later, Tudor came to appreciate Lenore’s wit and would seek her out at lunch breaks. Lenore always thought of Tudor’s Lilac Garden as a great work; she particularly liked the climax where he freezes the dancers in a tableau. Tudor often entertained himself while teaching, at the expense of the students, by saying things like, “Okay, for the combination today let us have all the virgins in group one and the non-virgins in group two.” Lenore and all the other young female dancers would just stand there unsure what to do. Tudor would dissolve into peals of laughter. However, the greatest trial was with José Limón. Lenore was majoring in Limón technique and had José as a teacher every semester for technique classes twice a week. She was convinced he did not really want to teach. Often, he would teach the class a dance combination and then look out the window for the rest of class. He completely ignored Lenore for seven semesters. Halfway through her eighth and final semester at Juilliard, José stopped class to ask her name. After replying, José said “Not bad.” Finally, recognition of a sort was achieved. Much to her surprise, two weeks later Limón asked Lenore to join his company. Unknowingly, she had passed an initiatory process. Shocked and thrilled, she accepted and began a decade (1959 – 1969) of performing and touring with the company. In 1960, she traveled with the company to South America as cultural ambassadors with the U.S. State Department’s International Exchange program. During this tour, Lenore would injure her lower back and while the injury never caused her to stop dancing, it would nag her throughout her life. Lenore’s favorite role with the Limón Company was of a harpie in The Winged. She loved the unusual and twisted movement vocabulary of that dance. 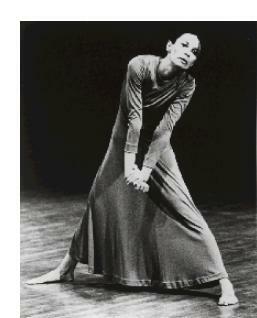 The 1960s and 1970s found Lenore working with other companies and choreographers along with her work with the Limón Company. She danced with the Anna Sokolow Company from 1964 – 1968. Lenore had great respect for Sokolow’s choreography, especially Rooms and Dreams. Lenore danced a role in Dreams, which is placed in a concentration camp. Lenore has described Anna Sokolow as being very intense. One time on tour in California the company had one day off. The dancers all headed out for a day away. The next day, Sokolow announced she was going back to New York because not one of the dancers called her during the day off. The company was left to manage all aspects of the performance and carried on without Sokolow for the remainder of the tour. Lenore also danced with Valerie Bettis, Jeff Duncan and Art Bauman from 1964 to 1967. Art Bauman’s dance Dialogue, where he was photographed in the Time Life Building, was very memorable to Lenore and Burlesque Black and White was her favorite choreography by Bauman. At the age of 40, Lenore decided she had “…taken enough orders and now wanted to give orders.” So she created her own company which was active from 1978 to 1982. Lenore had been choreographing from the age of 15. Very often a particular piece of music was the kernel of inspiration. Lenore loved puzzles and played bridge for many years. For Lenore, a dance was a puzzle with the dancers, movement, concepts and music all pieces to bring together in a coherent way. She liked the complexity of making dances, of planning every move and count of music. She entered rehearsals knowing exactly what she wanted to create. Managing a company with the usual changing cast of dancers and expenses of concert production was “very hard.” Nonetheless, Lenore’s company contributed to the vital New York city modern dance world during this period with performances at the American Theatre Laboratory, Dance Theatre Works and the Riverside Dance Festival. Completing a cycle, Lenore returned to Connecticut College to teach Limón technique at the American Dance Festival. In her home base of New York City, she was a longtime teacher at the Clark Center for Performing Arts. Founded in 1960, the Clark Center was a mecca for dancers until 1990 with a very fruitful period in the 1970s. Lenore’s longest teaching assignment was at Bard College, a small liberal arts college located 100 miles north of her New York City apartment. From 1977 through the spring of 2012, Lenore commuted via the Amtrak rail line, often with The New Yorker magazine in hand, a weekly or biweekly pilgrimage lasting 35 years. During her time at Bard, Lenore taught all levels of Limón technique, Movement for Actors, Dance Composition, and choreographed an original work annually for student dancers. She also served on sophomore Moderation boards and Senior Project boards. Decades of dance majors were influenced by Lenore’s teaching, choreography, and values. Even at 77 years of age, Lenore demonstrated for all her classes; her 180o front battement (leg lift) was always eye catching. I landed near Bard through a convergence of circumstances. In my late twenties, as a young dancer finishing my Master’s in dance education at Columbia University, I was told to leave New York City by a pulmonary specialist. Luckily, I was offered a job developing a dance program at a private secondary school in Dutchess County and I moved north to get married. Lenore’s classes were my life line to the dance world I had left in New York City. From the very first class with her I found joy. That joy never ceased in nearly three decades of classes. Lenore never pandered to her students; her classes were for professionals. Enter the studio, focus, and dance. She never broke material down more than necessary, which made the sequences of movements flow and that flow is what created the joy for me. Lenore presented glorious phrases and combinations. Woven into her own fluid and lyrical style were motifs from Doris Humphrey and José Limón masterworks. Never making a big deal about the origins of the material, Lenore let the material speak for itself. In her classes, one had the opportunity to dance the history of modern dance from the suspended lifts and breath-filled origins of Doris Humphrey to the drama-laced claps and stomps of José Limón. Always for Lenore there was an emphasis on the relationship of each movement to breathing. That relationship is more established in current dance vocabulary, but teachers like Lenore helped to create a breath-based form of movement expression. “The poetry is in the torso, move your core body,” she would exhort us into fuller chest lifts and larger lateral falls. The stabilized and frozen core body of many a young dancer was brought to life under her guidance. Lenore cultivated arm and leg movements that emerged out of a breath-inspired core, leading to unified and fluid whole-body expression. Lenore was passionate about the music of Bach for accompanying class. She loved all the sixteenth notes and counterpoint. She would tolerate and even enjoy other kinds of music for the warm up and barre. She would be fairly patient with Chopin, and she would say, “Something Spanish” for portions of class. She enjoyed challenging a class by presenting material in 5/4 time. However, she was happiest when watching a class dance to Bach, particularly if we were dancing well. Many years into my attending Lenore’s classes, she complimented me as I passed by at the end of a class, “Beautiful dancing.” I was exhilarated by her compliment, which at that time years ago was rare. That weekend I spoke with my dance colleague Ruth Clark, who had taken Lenore’s classes at the Clark Center in New York City. When told of Lenore’s comment, Ruth said, “You can die now; Lenore has recognized you.” Such was the esteemed position that Lenore held for so many of us dancers of a certain era. The last dance Lenore choreographed was for the Bard College Senior and Faculty Concert in the spring of 2012. Vanishing Octet exemplified many of her traits as a choreographer. The music was by Albinoni and the dance was choreographed in the Limón movement style. Eight young women entered and exited, dancing beautiful phrases, and filling space with movements that cleanly arced and curved through space in relationship to each other and the musical score. Toward the very end of the dance, one by one, the dancers stopped moving and become focused on cell phones which surreptitiously emerged out of their costumes. All movement ended, the music ended, the lights darkened. The audience was left with the glow from the screens of the phones, spread across the stage. Many of Lenore’s works offered social commentary in unexpected ways. Vanishing Octet was no exception. Lenore avoided technological advances, never having an answering machine or a computer. Her life was dedicated to the beauty and power of the expressive movement of the human body. No electronic screen could match that for her. Vanishing Octet, like Lenore herself, left an indelible and memorable impression. Lenore received a diagnosis of lung cancer in late spring of 2012. She planned to have treatment over the summer and to return to teaching in September. More tests revealed the cancer had spread to her bones and liver; she was advised that she had 4 – 6 months to live. She made the choice to have hospice care and settled into her New York apartment. As word spread of her situation, decades of students and former colleagues contacted her from around the world. Her apartment filled with flowers, the phone rang regularly and her agenda filled with visitors who wanted to connect with her. Lenore had often been quite solitary in life; after her diagnosis she and I joked that she became a social butterfly. “I have had a great life and I have done everything I wanted to do.” Lenore made the same statement to everyone. In the four months after the diagnosis, Lenore answered the phone with a strong hello and welcomed friends into her apartment. She never expressed fear of death to me. She never complained. She did not want to suffer pain and thanks to medications she was comfortable for most of her time. I was with Lenore a week before the day she passed. Lenore, her sister Peggy and I sat around the small dining table; the simple food I brought from a delicatessen somehow transformed into a feast because of our appreciation of the moment. Lenore laughed and told stories. We talked about movies and architecture. She was interested in a recent trip I had taken to Scotland with my husband. Lenore was frailer than my last visit but still full of wit, strong opinions and a wicked sense of humor. Lenore and Peggy bantered back and forth in a lifelong sisterly pattern. At that moment, I thought I would have more time to spend with her, to document her life and work. A few days later she slipped into another phase of life, almost between two worlds. Then a few days after that on Wednesday, September 26, in the early morning hours with her sister Peggy and her niece Vicky at her side she passed peacefully into death. As fate would have it, I was able to tell Peggy and Vicky, who had tended Lenore with love and care in her last phase of life, that I would be teaching in Lenore’s honor in just a few days. Months earlier, I had been invited by the D’Amby Project in Red Hook, NY to teach a master class in the Limón technique. I would be transmitting Lenore in my teaching. I would be sharing what I understood of the Humphrey, Limón, Latimer legacy. What better tribute to Lenore and what better solace for myself than to keep Lenore’s spirit alive in the dance form she loved. All photography and other artwork on the this website are under the copyright of the individual photographers and artists.